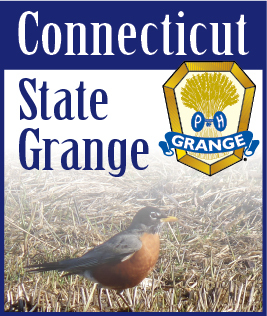 National Grange President/Master Ed Luttrell visited Connecticut on Friday, April 9 as part of his national speaking tour of State Granges. The meeting was held at Hemlock Grange Hall in Portland and was attended by over 70 members and guests, the best turnout of any single meeting nationwide. Brother Luttrell introduced his theme for the Grange year - "The Second Seven." This theme refers to the original seven founders of the Order and the idea that we all have the opportunity to be the "Second Seven" to carry the Grange forward into the future. The talk was divided into topics such as the financial condition of the Grange, growth, communication, discussion of the name protection effort and a question and answer period. The first part of his talk focused on the duties of all Grange officers and stressed the importance of responsibilities that are both written and unwritten. Empowerment of members, grooming members to take our places and providing value (Wow Factor) to our Granges through newsletters, dinners, and simple connections to other members were discussed as ways to help grow the Grange. A great deal of Brother Luttrell's talk focused on the financial condition of the National Grange. The chart below illustrates the sources of income that sustain the National Grange. The largest single source continues to be the National Grange Building itself (celebrating its 50th year of service to the Order in June). Dues and fees are a close second to the building in providing income to the National Grange. The building has provided an 83% return on investment. Its location one short block from the White House makes it a prestige or status symbol for businesses and organizations able to call 1616 H St. NW as their address in Washington, D.C. This building is owned "free and clear" with no mortgage or other encumbrances placed on it. Expenses for the National Grange (see chart below) are unusually low compared to similar nationwide organizations. The battle over name protection (notably Tyson) caused legal expenses to climb to over $448,000. Last year's budget was $109,000 in the red. When budgeting for the year, $275,000 in donations was forecasted to come in and help with the fight over name protection. $67,000 actually came in and all donations basically stopped when word of Tyson dropping their suit spread across the country. Deficits in National's budget have been taken from reserve (cash) funds that are nearly depleted. Moving forward, National is working to look at new funding sources along with setting priorities for the new year which include 1) Development and implementation of training and materials. 2) Working to develop new and re-organized Granges. All departments of the National Grange have worked hard to save every nickel and dime to offset the budget shortfall. An example cited by Brother Luttrell involves the upcoming celebration of the National Grange building. In the past, it has been commonplace to produce large numbers of commemorative items. The items would be put on sale at a "full price" and then would be put on sale at a dramatically reduced price to help clear out all of the extra items that did not sell at full price. Only 100 sun catchers have been produced for the anniversary celebration and it is unlikely addtional catchers will be ordered unless they are sold out well in advance of the June celebration. In addition, the program of sending National Representatives to State Grange Sessions across the country has been suspended for the current year, unless States are able to make requests for National Representatives that don't cost National money. Brother Phil Prelli was asked to take over the presentation regarding Communication. His talk highlighted the evolution of communication in today's world which focuses more on electronic information from sources like Facebook, Twitter, blogs, podcasts, YouTube, etc. He also emphasized the need to get our members talking to one another and the need to actually listen to what they have to say. The last part of Brother Luttrell's prepared remarks centered on the ongoing name protection program. As mentioned above, Tyson has withdrawn its suit and the Aldi supermarket chain has agreed to cease use of the Grange name by December 31 of this year. The battle continues with scores of companies worldwide which continue to use the Grange name. A new food company out of Canada has expressed its desire to use the Grange name and has little concern for American law. Moving forward, the National Grange is working on changes to be made to the Digest outlining the process to be used for all Grange subsidiaries using the name. National will continue to defend all challenges to our trademark-- if we don't defend it, we risk losing it permanently. Filing will begin on trademark sub-categories and legislation protecting the Grange name will move forward in the future. It has been placed on hold for now due to the bitter atmosphere in Washington following passage of the new healthcare reform bill. Grange Growth has been a major focus of the CT State Grange over the last year. A report will be given next month by Jody Cameron outlining the steps that will be taken to achieve some of the goals outlined above by Brother Luttrell.